Napier’s tourism industry has been struggling for some years now. Some blame too much focus on cruise ships for the decline. Others blame Napier City Council for not doing enough to Marine Parade, or the uncooperative relationship that exists between Hawke’s Bay’s many councils. HB Inc. / Venture HB / HB Tourism (if you’re new to the region they’re all the same organisation with mainly the same staff, just under different names after years of reorganisation or failure) have also faced their share of criticism. As has Air New Zealand (have you tried finding a cheap flight to or from Hawke’s Bay – one of New Zealand’s busiest regional airports?). I feel most of these criticisms have their merits. But I have seen a theme run through a lot of Hawke’s Bay tourism schemes and advertising in recent years that may be doing even more damage: Luxury. When times are tough and money is sparse (as it is currently), what is the first thing you usually give up? The “luxuries”! So why is that such a feature of so many HB tourism ventures recently? Sure they are attractive to a select few for their exclusivity (“ponce-pulling-power”? ), but as a result they also cater to only a very small portion of the market for only a small amount of time. From an accommodation perspective, take the likes of the Kidnappers resort (scarily expensive to mere mortals like myself), or closer to home The Dome in central Napier (don’t even get me started on how our Art Deco-mad rulers let them build a modern addition atop one of Napier’s most iconic buildings…). Both make a point of being exclusive and luxurious. But, at even their cheapest winter rates, how many people will ever get to know precisely how luxurious they are? They also appear geared towards just individuals or couples too. The typical middle-income-earning Kiwi family holidaymakers, surely Hawke’s Bay’s biggest and most lucrative domestic market, don’t get much of a look-in. But I guess that’s the whole point, right? It’s a case of the money versus the many. Case in point: Kidnappers hosted an event with international celebrity chef, Heston Blumenthal, a few years ago. For the price of a ticket to this event (a night or two’s accommodation and accompanying meals) you could have flown to England, dined at Heston’s original restaurant, The Fat Duck, spent a few more days seeing the sights and still had change for duty free on the return to New Zealand! Somehow the event still sold out. I’m guessing not many locals bought tickets. I wonder how long these types of venture usually last (I think at least one of the two examples I mentioned above has changed owners at some stage)? If one night’s accommodation is that pricey, and guest nights must be pretty slim as a result, imagine what their running costs must be. I make this point about longevity, because two of Napier’s most popular and longest standing holiday accommodation providers, Kennedy Park Camp Grounds and the iconic central Napier Criterion Backpackers hostel are not only some of the city’s oldest establishments (Kennedy Park celebrated a whopping 75 years of operation recently and “The Cri” was built after the 1931 Earthquake, ironically, as a luxury hotel), but also some of the cheapest! Accommodation providers are stuck between a rock and a hard place, though. The less people staying with them, the more they have to charge to make ends meet. But the more they charge, the fewer customers are inclined to spend the night. It’s a vicious cycle. One of the cosiest hotel beds I have ever slept in was at the Jucy Hotel / Hostel, just 200 meters from Queen Street in Auckland. The rooms were quiet, bright and modern. They had great new facilities, a flat screen TV, a modern stylish bathroom and cost just over $100 including a carpark for the night. Where else could you find value for money like that in New Zealand’s biggest city, or even Napier for that matter? The popularity and longevity of Kennedy Park and the Cri Backpackers and my experience at Jucy prove that money can’t always buy you a good night’s place to rest. A high price does not equal luxury! Rather than go for the ‘vanity factor’ and charging accordingly, ultimately scaring potential clients off, I think Napier Hoteliers / Moteliers need to go back to the basics. Provide a comfortable, family-orientated place to stay at an attractive price. The reduction in individual price will pay off in spades, as more guests stay for longer. With the summer tourist season fast approaching, I wonder how many operators will try it? *The “Spit” Mr Twain refers to is now the area we call “Westshore”. Pre-1931 earthquake, it was a long, thin spit of land at the entrance to the then harbour, now Ahuriri fishing port. 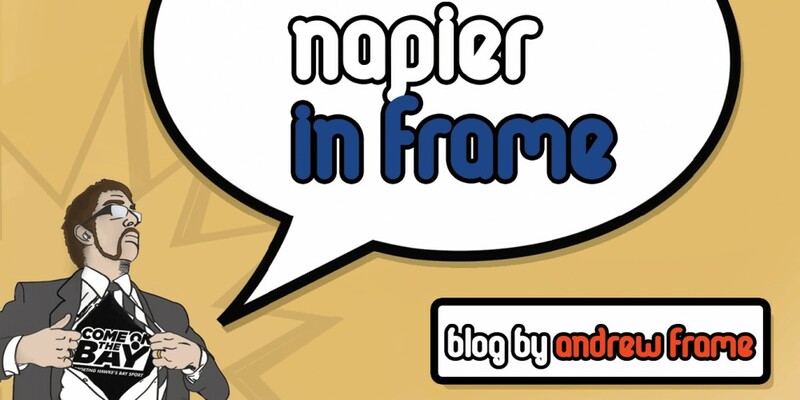 This entry was posted in Hawke's Bay, Opinion and tagged Hawke's Bay, Napier, Opinion, Tourism by Andrew Frame. Bookmark the permalink.